Can the Citadel Investment Group Survive? Can Citadel Recover After Sustaining 35% Losses In Two of Its Major Funds? This prolonged (and violent) market downturn has called into question the long-term viability of many hedge funds. Manny Roman, co-chief executive of GLG Partners, recently stated that he believes that many hedge funds will "simply disappear." Roman believes that the hedge fund industry will shrink by "almost a third" as many funds go out of business. Rumors have been swirling over the past few weeks regarding the financial condition of one of the biggest and best-known hedge funds, the Citadel Investment Group. It is always hard to glean information regarding the financial well-being of a hedge fund because they are notoriously tight-lipped. The hedge fund industry is shrouded in mystery, and unless an investor in the fund or the fund itself speaks out, it can be hard to determine just what is going on. 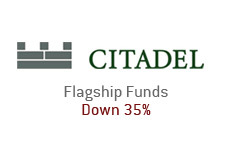 People have said that Citadel's two major funds are down 35% on the year. The Wall Street Journal recently published an article stating that examiners from the Federal Reserve have questioned Wall Street counterparties to Citadel about their "exposure to debt and other holdings of Citadel Investment Group." The rumors have picked up in intensity over the past week or so, and this forced the company to hold a conference call to address some of the rumblings. What is the exact truth? Who knows. Did Citadel ask the US government for a cash injection as some believe? Or is the Fed simply "keeping an eye on Citadel and other funds" as other people believe? Another question - can Citadel possibly recover after seeing its two flagship funds take a 35% beating? History is not on Citadel's side - 35% declines in the hedge fund industry are back-breaking and nearly impossible to recover from. Time will tell. Keep an eye on this story, as I am sure that there will be more news over the coming weeks.